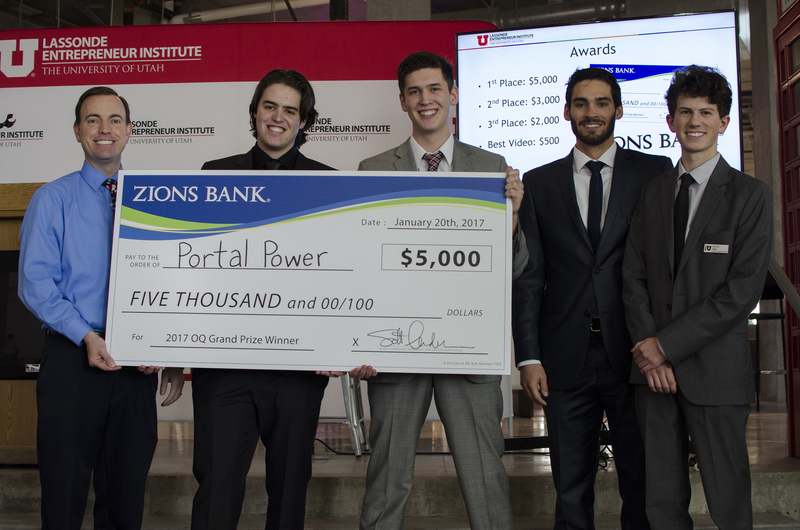 Student startup Portal Power won $5,000 and first place in the 2016-2017 University of Utah Opportunity Quest (OQ) business-plan competition. Ten collegiate teams advanced to the final judging and awards event. The competition is managed by students at the Lassonde Entrepreneur Institute at the University of Utah and sponsored by Zions Bank. Other top teams included Neiybor and Grace Foundry, which won second ($3,000) and third place ($2,000), respectively. Portal Power created a cord based on the nuisance and frustration of the current battery charging market. Portal Cord, their product, provides both back-up rechargeable, on-the-go energy, and also acts as a USB charging cord. Portal Power is developing a charging cord that doubles as a backup battery. Second-place winner Neiybor is a peer-to-peer online marketplace that allows renters to find storage space at a fraction of the cost while hosts earn extra monthly income. Grace Foundry, the third-place winner, started as a gaming company and is currently shifting to virtual reality. Each of the teams said this experience has improved their view on their product and company. The judges and mentor feedback allowed them to meet new connections to broaden their company. Opportunity Quest is an executive summary competition. The Lassonde Institute, a division of the David Eccles School of Business, hosts branch OQ competitions across the state at partner universities. All participants are judged by industry experts based on the quality of their submission and pitch. Winning teams receive cash and in-kind prizes and advance to the Utah Entrepreneur Challenge, where students develop a full business model. Today’s final pitch event was a culmination of two weeks with mentors and workshops honing the finalists’ pitches for the panel of judges. All top-10 teams at the U event walked away with smaller prizes and offers that include pitch consulting, company launch resources and more. Download a photo to use with this news here. Events, Press Releases Competitions, Opportunity Quest, Utah Entrepreneur Challenge. Permalink.